This is the perfect mix of our compost and wheat straw. This mushroom substrate will produce great results for dung/straw loving fungi species. You will get much larger yields using this 50/50 mix compared to just casing grains or all-in-one grow bags. This product is sterilized and ready to use at your front door. Simply add your gourmet mushroom spawn to the 50/50 grow bag, reseal it, and mix. 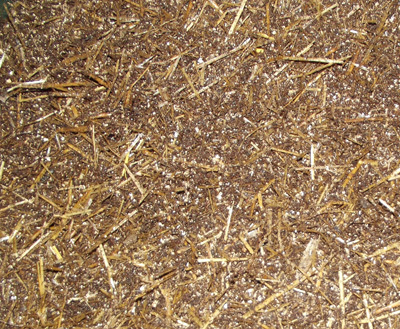 Out-Grow's straw/compost mix is one of the best mushroom growing substrates available on the internet. We use only natural and chemical free products to make our substrates. 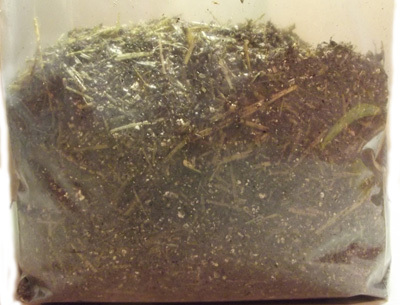 Out-Grow uses field leached and shredded horse manure, shredded golden wheat straw, coconut coir, vermiculite and a couple other secret ingredients to produce a high quality mushroom substrate with a very nice, airy texture. Out-Grow's 50/50 mix will come heat sealed and sterilized in a mushroom grow bag for your convenience. You can grow right in the bag or add to trays or tubs to grow in. Date Added: 12/08/2018 by Juston S.
First time ever growing and i split a quart of spawn between 3 lbs of this awesome substrate and i just finished flush 4 or 5 i can't remember. Lol. Amazing!!!!! Date Added: 12/04/2018 by Adam K.
Date Added: 10/05/2018 by Tyler M.
I've been buying this bulk substrate for more than 2 years now and not once have I ever gotten a contamination. You can't go wrong buying from these guys. Date Added: 06/28/2018 by Dominick A. Date Added: 05/10/2017 by Lance A. This is the fasted colonizing substrate ive seen from a bulk transfer and i used brown rice flour spawn 1: 2 as a experiment! Fast shipping and great prices! Outgrow manure 50/50 substrate is top notch! The prices are very low for such a qauilty product, and for that this site is the only site using for my growing needs! And believe me ive shopped around! Date Added: 05/26/2013 by Brandon O.